Did you know that hospitality is one of the largest industry in the world? Working with people every day can be blissfully rewarding and yet equally stressful at the same time. Sale assistants and hosts are focused on providing quality customer services for clients. But who will provide their wellbeing inside your store while ensuring your products are protected? If you have a retail store and are wonder how you can improve the workplace for your employees and minimise the loss, this article is just for you. One of the most common mistakes nowadays is to assume that nothing can happen to you. Some of my retail store clients believed that their store doesn’t pose a threat as is too small. When in fact this can be the most powerful reason for people with bad intentions to strike. As is not very well protected, doesn’t have a panic button alarm, CCTV, anti-theft devices, is not tidy, very well organised and so on. Others considered that all their customers are genuine. A huge mistake that can cost your business loss. I personally have encountered various shoplifters from different backgrounds. While other clients consider that their insurance will cover this aspect, they tend to forget that their insurance premium price will go up every year. 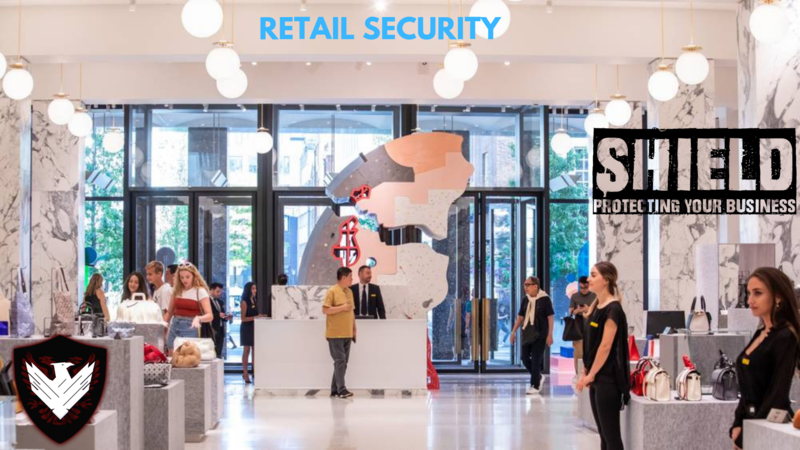 Let’s have a look at the most important aspects related to a retail store and what a security officer should focus on his line of duty. While working for prestigious retail clients, I had the opportunity to improve my skills and learn more about the glamorous life of celebrities. Let’s face it, the most important aspect of retail is customer service. A happy client means a happy business, right? In order to maintain a role model, every security officer needs to understand that the store clientele experience starts and finish with him. Furthermore, from the customers point of view, security officers are part of the store brand they represent and not of the security company they work for. However, there are also concerns related to security, both for your reputable clients and staff. Quite frankly, where celebrities hang around, either when they do shopping or other activities, there’s also an increased chance of stalkers to shows up. Surely, you don’t want the hassle of dealing with unhappy clients complaining that their belongings went missing while they browsing around your store. Another detail to consider, most certainly the major one after the customer service, is the aspect of theft. Your products displayed on the store shelves can become unaccounted for in a moment! There is no profile of a typical shoplifter, most retail crimes are crimes of opportunity. That means shoplifters will target high value with minimum risk and effort. Personally, I have reviewed numerous hours of CCTV footage where people browsing around found the chance to make off with expensive products from the shelves. You won’t guess what I’ve discovered. It takes 5 to 7 seconds for a small item to be taken and concealed in the pocket. That’s why I manage to set up a better process of identifying shoplifters and prevent thefts to occur. As a tip, I always recommend that the security officer who is the first point of contact for meeting clients, to do a screening of those who enter the store. Looking for particular details, such as matching the customers dress code in accordance with the weather that’s always a good place to start. To go more into details, a customer who is wearing a large jacket on a sunny day should raise a red flag, as this can be often used to conceal stolen items. Another tip for the security officer who opens the door for clients is greeting the customers with a bow. Although his action will be perceived as great customer service, he will have a chance to get a quick glance at the customers bags for anything suspicious. It is always desirable for security officers not have a static position at all times, except for particular areas with an increased chance of shoplifting. I always preferred to walk around in a crowded store along with the customers. In this way, I was able to feel the energy of the people, making easier for spotting unusual behaviour. With this approach, SHIELD was able to reduce the shoplifting with more than 54% comparing with the precedent year. Optimising the store layout with plenty of mirrors will create a less thief friendly environment. Fitting rooms should always be manned and a security officer should take a stance in the near proximity paying attention to what is going in and out. As a good practice, every morning before store opening, products on display should be checked for security tags. On top of that, the integrity of the alarm system for the store egress should be checked frequently. Be aware of shoplifters tactics. They tend to use certain aluminium foils to cover security tags on their way to exit. This will prevent triggering the alarm system. One of their preferred methods is to use distraction as a way of covering their action. They can even trick security officers, not only clients advisors. Working in groups, one of the shoplifter mission is to distract the attention and perturb the focus of a target surrounding. They can use any technique from asking direction, interest in viewing a product not displayed, or even creating a perturbation by starting a quarrel. In this way, other shoplifters can operate without being seen hence all the attention is disturbed. Another tactic encounter among the shoplifters is to use a child. As an example, I was a witness I will give you the long story short. A woman entered a luxury store pushing the buggy with her daughter. At some point, the child dismounts the buggy and went straight to an unsupervised counter. From here the child who was not older than 4 years old grab an expensive key ring and went on the other side of the store where her mum was expecting her. Luckily the security officer on duty was vigilant and we manage to recover the item. Even more importantly, both sale assistance and security officers should carry out a customer services strategy. What I mean by that is to greet genuine clients, but also making aware potential shoplifters of our presence. Before anything, it is crucial to have in place certain procedures like lost child, pickpocketing, deterring thieves and evacuations. Vagrancy is another aspect to consider. If beggars take a stance in front of your store, you surely want them to leave to not turn your customers away. Like any other jobs, static security can be challenging. Therefore, it is better to prevent numbness and routine by cycling security officers between different stores. Let’s not forget, one of our role as a retail security officer is to support the store business strategy. And contribute to enhancing the client experience in the store. Last but not least, a friendly environment between security officers and staff will ensure goodwill, cooperation and promptly defusing of any incidents that may occur. That’s why, here at SHIELD, we don’t sell dreams, we offer security solutions.